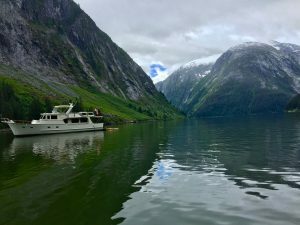 I have been lucky enough to spend three months on a boat motoring thru the waterways of the Inside Passage from Anacortes, Washington to Glacier Bay, Alaska. Being so immersed in the grandeur and beauty of nature changed me in ways that are hard to describe as if I returned to an expansive place within myself I’ve always known but had forgotten. There was definitely a spiritual quality about the voyage. The wild landscape of Alaska opened my heart to an untamed splendor that refused to be held by anything other than my soul. Three years ago I had a similar experience when I walked the Camino de Santiago from Portugal to Spain and when a friend asked me to sum up my trek in one word, Gratitude was my immediate response. The word that resonated from my boat experience was Forgiveness and that kind of took me by surprise since it was not something I had on my radar. About mid-way through our journey my husband and I were nestled in our deck chairs at the stern of our boat with fleece blankets wrapped around us to keep us warm. Our evening outdoor sessions had become a ritual I relished as we sat quietly together content to do nothing other than take in the primitive surroundings. This particular inlet on the east side of Baranof Island was secluded and we happened to be the only boat anchored in a place that looked more like an alpine lake than a ocean cove. Towering gray granite walls surrounded us covered with dark green pine trees and leafy vegetation. A cool breeze brushed our cheeks as we listened to the sounds of a hidden stream trickling over a rocky pathway into the still pool of water below. The singsong cry of an eagle could be heard in the distance and an occasional splash of a jumping fish. A deep contentment settled over me, as if every cell of my body was relaxed and at home. I also noticed a compelling desire to share this experience with others yet when my husband mentioned the name of one particular couple I felt an immediate constriction in my gut. The feeling seemed completely out of sync with the spacious place I had been living for the last eight weeks. And yet, there it was, the part of myself that can be small-minded, insecure and sometimes petty. Now, it no longer felt comfortable. Alaska seemed to be whispering in my ear that life if too grand and wondrous to harbor a grudge and like a snake needing to shed an old and dried up layer of skin, my grievances felt too confining. Then an image came to mind of the water beneath me being a deep pool of forgiveness that embraced me while gently coaxing me to release all my hurt, anger and disappointment into her watery depth. It seemed so simple in that moment to just let go. The next morning I kayaked to a huge waterfall about a half-mile away. Drawing close to the cascading water I could feel the mist cling to my face and hair. When I looked closely at the water tumbling over the rocks I could see countless patterns and smaller waterfalls contained within the larger one. A powerful “yes” welled up within me and I said the word out loud three times, “yes, yes, yes.” I didn’t even know what I was saying yes to but it felt like I was consenting to a new way of being, or maybe just saying yes to the radiance surrounding me and to forgiveness. It was like a shell around my heart was being pulled away leaving it undefended and vulnerable but also spacious and free. I don’t think an undefended heart is possible without healthy boundaries and an awareness of a divine love protecting it, yet forgiveness demanded I let go of my defenses and the old narratives I clutched onto like a tattered and familiar stuffed toy. A line from a poem by Christine Valters Paintner captures my experience beautifully. I want to forgive a thousand tiny and tremendous transgression because now all that matters is how small I feel under the sky, even the sparrow hawk takes no notice of me, how enlarged I feel by knowing this smallness. Later, my husband asked me, “Do you think this view has changed much in the last 1000 years?” I thought of all those who had come before us; the explorers like John Muir, the hardy fishermen, the native Tlingit tribes, the whales, otters, bears and salmon – “probably not,” I answered. It is a strange thing to think I could come and go from this earth without leaving a mark, that the view will remain unchanged in a hundred years long after I am gone. But there is also freedom in knowing how small I feel under the sky and how enlarged I feel by knowing this smallness. It is from this broader perspective that I am able to see the harmony in things that appear contradictory; the wonder and harshness found in nature, the light and the shadow within my self and others, the generosity and horrors played out on the world stage. Somehow it all gets woven into a larger tapestry that is fuller and richer because of its imperfection and is quite stunning. I still struggle with being disappointed or resentful when people don’t behave the way I’d like, including myself, or when scircumstances don’t work out the way I planned, but when I think of Alaska something within me loosens and I no longer feel the need to demand life abide by my rules. A space begins to open in my spirit that allows me to accept life on life’s terms and that is what forgiveness is really about.